John Anderson is a resource for sustainability and green design issues under the Leadership in Energy and Environmental Design (LEED) Green Building Rating System. John was the first LEED-Accredited Professional in the state of Louisiana in 2002. John leads the studio in design to meet the particulars of the climate, which results in a regional modernist architecture. The Waveland Business Center was inspired by the double-roofed structures prevalent in the south, with other projects derived from dogtrot cabins and traditional vernacular forms. His use of materials is wide and eclectic, incorporating salvaged material at 443 Main Street and the Little Theatre. John has taught architecture at the University of Texas. 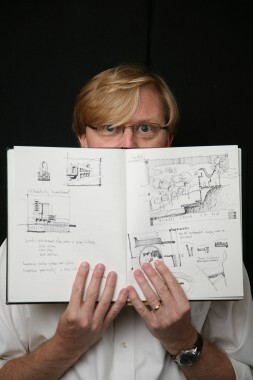 Prior to joining unabridged Architecture in 2007, John worked for 13 years at the award-winning firm of Eskew+Dumez+Ripple in New Orleans, Louisiana. He was the project architect and LEED professional for two Silver-rated projects: the Key West Weather Forecast Office, and Dr. Nancy Foster Environmental Education Center. John began working with a group of interns and architects in 1998 to share his commitment to sustainability, adopting LEED and its core principles, ensuring green building principles were incorporated into all projects, and encouraging clients to pursue LEED Certification. He continues to provide sustainability seminars, currently developing standards for Hot Humid Climates.